Event companies and party planners are some of our best clients; if they’re looking for a noteworthy experience and some swag for their guests to go home with, we’re all in. And in the ever-growing eco-friendly world we live in today, tote bags are a very popular choice, because, who doesn’t need one for that next trip to the grocery store or farmers market? The tote bag has always been around, but now that it’s in an even brighter spotlight, why not take advantage of it and use it to advertise your brand? 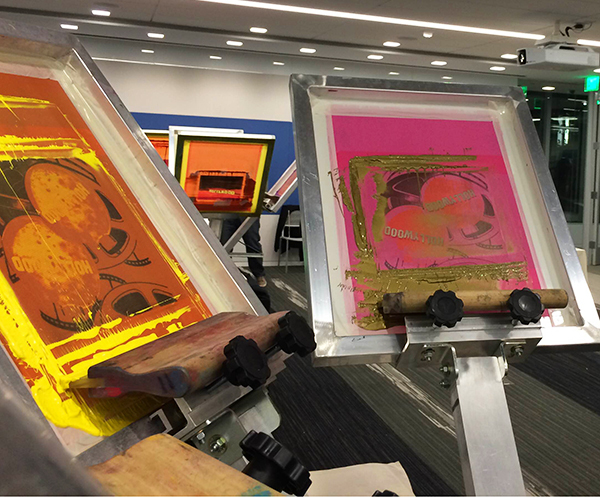 Ink+cotton takes it one step further, and inserts an experience into the whole idea, hence live screen printing. Tote bags & ink+cotton live screen printing = a match made in heaven for your brand activation! Speaking of tote bags and ink+cotton… the event planner’s behind DirecTV’s corporate holiday party asked us to create a memento for their employees to bring home from the event. 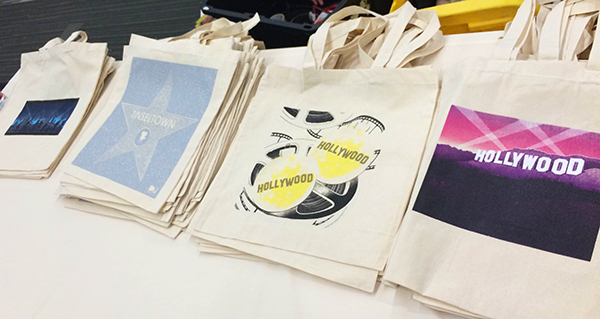 We live screen printed 4 festive Tinseltown-themed tote bag designs for their guests. All of which we’re sure have, by now, gone on a trip to the grocery store at least a few times!